The theories of Daoism remain to this day the underlying theories of diagnosis and treatment in Chinese Medicine. In this article I will briefly introduce and examine the theories of the San Bao (3 treasures), Yin and Yang and the theory of the Wu Xing (5 elements). 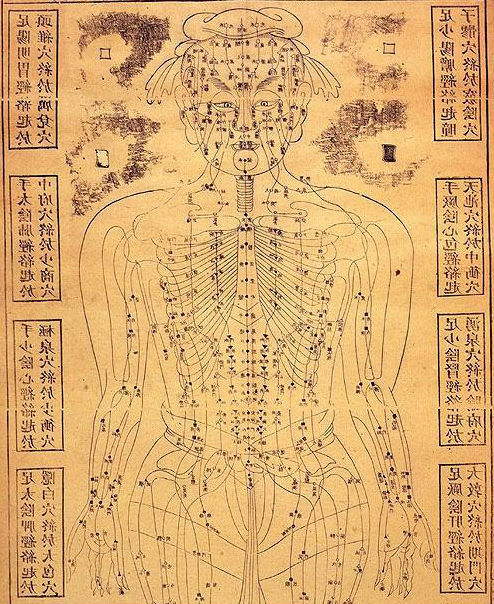 The natural and holistic elements of Chinese medicine originated from the ancient Daoist’s observation of the changing energies within the human body and the outer environment. They examined and codified the patterns of movements they witnessed and based their practices and arts on these theories. The underlying principle behind the Daoist ontology is that of a hologram or fractal; the definition of which is that each part within a structure directly mirrors the whole structure and vice versa. That is to say that everything that exists is a result of a coordinated fractal division which originated from the Dao itself and in this respect everything that exists is a fractal manifestation of the Dao. This process of refraction begins within consciousness and continues to decrease its base resonant frequency until it becomes dense enough to be classified as physical matter. The Dao De Ching states that ‘Dao is void, Yet inexhaustible, It is the fathomless origin of the myriad things’. This is the primordial original state of being literally translated as ‘the way’ but accounting for the underlying nature of everything which can neither be named nor understood. From this state emerges the realm of consciousness (Shen), energy (Qi) and physicality (Jing). Together they form the San Bao (3 treasures). 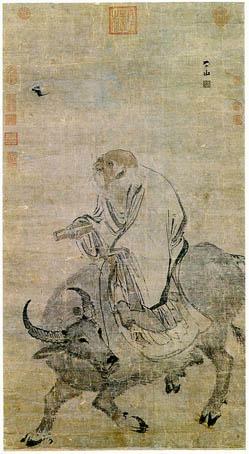 Shen vibrates at the highest frequency closest to Dao and is the most refined form of substance. Qi vibrates at a lower frequency and becomes less refined than Shen. It is still however a more subtle substance than Jing which vibrates closest to level of physicality. However it is not the case that something is simply Jing, Qi or Shen for in reality there is no such thing. Rather the San Bao (3 treasures) indicate a spectrum of vibrational frequencies which all phenomenon maybe categorized into or labeled as (Fig. 1). For example the mind is categorized as vibrating at the frequency spectrum of Shen whereas the physical body is categorized as vibrating at the frequency spectrum of Jing. The vibrational states are always more fundamental than the lower states. Each lower state of vibration exists only in virtue of a higher state existing above it; thus consciousness is more fundamental than physical matter and physical matter cannot exist without consciousness. In regards to the example given above the physical body is a direct reflection of the mind and cannot exist without the mind and not vice versa. Already we can see a core belief within Chinese Medicine emerge here in regards both to the inherent link between the mind and body but also in physical disease being a lower vibrational expression of a fundamentally mental imbalance. It is crucial to understand that in actuality Daoism and Chinese Medicine claim that there is no difference between physical matter and consciousness; it only appears so because they are vibrating at different frequencies. For example in Chinese Medicine a lack of will power may exist within the realm of Shen whereas a weak lower back and knees may exist in the realm of Jing. But in reality there is no difference between the three phenomenon’s; they are simply different vibrational expressions of the same thing (Fig. 2). The weak lower back and knees are simply a physical expression of the more fundamental mental imbalance (characterized in this case according the Wu Xing theory being an imbalance in the water element). In the Qi realm this manifests as a Kidney deficiency. As we have seen before Qi exists between Shen and Jing and in Chinese Medicine according to the theory of the San Bao one can only communicate one vibrational scale up or down from the level being worked with. For example if we affect the Jing we may affect the Qi but the Shen remains relatively untouched. However if we affect the Qi we can affect both the Jing and Shen correspondences of the phenomenon. Hence Chinese Medicine emphasizes treating the Qi as we are able to treat both a greater spectrum of problems but also affect the consciousness of the individual which as we have seen is the most fundamental aspect and therefore the route of all disease. Far from appearing supernatural it is in fact an ultra-natural system of healing; the profound effects of a correctly performed acupuncture treatment are a result of a detailed understanding the holographic nature of the universe. In the case given above the Kidney Deficiency may be treated to then affect the will power and the weak knees and lower back. This illustrates one way in which the treatment in Chinese Medicine utilizes a fundamentally Daoist concept. From the Dao emerges a process of refraction which sees consciousness (Shen) transform into energy (Qi) and then transform into physicality (Jing). Whilst in one sense these refractions move further and further away from the original nature of the Dao the fractal nature of the division necessitates that within each fragment remains a blueprint of the whole structure. Therefore the Dao is apparent in each division and each division can be seen to contain the Dao. It is important to note at this stage that for the Daoist’s the primary goal was to reverse this creation process in order to transcend back up the process of refraction and refine their vibrational frequency to a point where they could rejoin the Dao. This was the underlying goal of the original Chinese doctors named (Wu Yi) or shaman doctors. Treating an illness was incidental; the ultimate goal was complete re-assimilation with the original state of the universe. This is revealed in the Dao De Ching; ‘He (the sage) draws in Heaven and Earth, And pulses with the Cosmos, Achieving transcendent comprehension, The true aim of all Sages’. In the last section we examined the original underlying premise on which the process of creation is based and the implications of the fractal nature of this theory. Now we will consider in more detail the specific movements and patterns within this process in order to understand the two key fundamental theories of Daosim; Yin and Yang and the Wu Xing (5 elements). In Daoism creation occurs when duality (Yin and Yang) emerges from a point of singularity (Wuji). Wuji is literally translated as ‘without extremities’ and describes a point of chaotic formlessness from which the original conditions for existence were merely potential and not yet actuality. The Daoist Classic the Tao-Yuan talks of how ‘all things were fused and were identical to the great vacuity… There was no distinction of dark and light (Yin and Yang).’ The Dao De Ching states that ‘Before Heaven and Earth was chaotic emptiness, It exists still since it is ever-lasting’. From Wuji, the movement of Taiji emerges and divides Yin and Yang (Fig. 3). Taiji is characterized as a spiracle movement of energy which emerges from the chaotic state of Wuji and reveals two opposing poles (Yin and Yang) which dictate the perpetual balance and relativity of existence. Taiji is the primary catalytic force behind all existence and Yin and Yang are terms used to label and describe the relative states of all things existing between them. 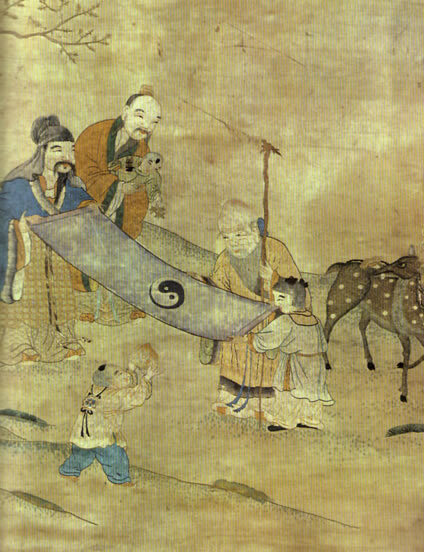 After Taiji’s spiraling force separates Yin from Yang they then continue to separate, firstly into Tai Yang (Greater Yang) and Shao Yang (Lesser Yang), Tai Yin (Greater Yin) and Shao Yin (Lesser Yin). These are illustrated in Figure 4. These four combinations of Yin and Yang then separate into the eight trigrams named as the Ba Gua. The Ba Gua then divide further and manifest as the sixty four hexagrams of the I Ching (Classic of Chnages). The Ba Gua and the hexagrams can be seen in Figure 5.Everything that is Yang is dynamic, warming, moving, high, clear, masculine and ethereal. Everything that is Yin is still, cooling, nurturing, supporting, low, feminine and physical. It is crucial to remember at this stage that nothing is Yin or Yang; phenomenon just have relatively more Yin or Yang aspects or are just relatively more Yin or more Yang. For example the wind can be considered relatively Yang as it is dynamic, subtle, moving, high and clear. In comparison to wind water is relatively Yin as it is slower, cooling, nurturing low and physically denser. However in comparison to ice water is relatively yang as ice is still, denser, more cooling etc. Similarly Qi is Yang compared to Jing however Qi is Yin compared to Shen as it is more refined and ethereal. The various combinations of these 64 hexagrams account for every possible combination or facet of existence; ‘everything in the universe can be classified into the polarity of yin and yang’. As Taiji emerges from Wuji and separates Yin and Yang (being the two extreme poles between which every possible combination within existence may exist) the Wu Se (5 lights or colours) emerge being; green, red, yellow, white and blue. 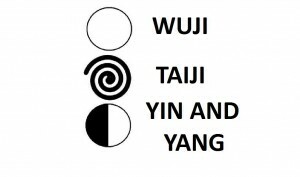 The diagram to the right illustrates how the movement of Taiji separates Yin and Yang from Wuji and generates the Wu Xing. 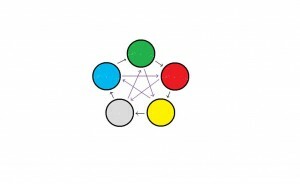 These 5 lights bring about the birth of the Wu Xing (5 elements) which are at their most fundamental level, colour and light. The Wu Xing are yet another system of checks and balances which govern, regulate and control each other. Like Yin and Yang they constantly exist in a perpetual state of movement and balance as illustrated in the chart bellow (Fig. 7). It is stated in the Nei Jing Su Wen that ‘abnormality of the Wu Xing can cause illness in people’. The Sheng (generation) cycle (shown with the black arrows going around the outside) illustrates the direct affect the element has on the one next on from it in the cycle. An element is said to generate another because its fundamental nature is a pre-requisite for the other to function; in this respect it is also known as the mother of the element after it. For example Wood is the element which expresses a primary catalytic movement; its straight forward direct movement provides the impetus of movement for all the other elements and especially gives the impetus for the Fire element to expand. Water is considered the mother of Wood as its nourishing quality enables the fast dynamic movement of Wood to remain smooth and controlled much like the function of a cooling fan in a computer. We also see that another cycle, the Ke (controlling) cycle (shown by the purple arrows crossing the middle) is apparent. Whereas in the Sheng (generation) cycle the element mothers, creates and nourishes the element next on from itself in the Ke (controlling) cycle the element regulates and keeps in check the next element along from itself. For example Water controls Fire due again to its cooling nature prevent the expansive movement of Fire to run rampant and get excessive. Fire in turn controls metal due to its expansive movement balancing the opposing contracting movement of the Metal element. It is important to note that the Wu Xing are not what they are named, that is to say they are not literally ‘fire’. They are just labelled as such because their most inherent nature mirrors that of Fire, Earth etc. They are very different from the western druidic elements. The Fire element is named as such because of its likeness to the natural fire due to its colour (red) and form of movement (expansion). However it is more accurate to say that natural fire is an expression of the Fire element and not vice versa. The element is far more fundamental than the physical expressions. Yin and Yang are not fixed labels, nor are the Wu Xing, they describe the endless interchanges, oppositions and movements between all phenomenon in the universe. When Yin and Yang are in perfect balance and Wu Xing regulate each other perfectly then is no opposition or division, change or movement and singularity will reform and existence will return to the Dao. This, again, is the goal of all Daoist’s and Chinese Medicine, to re-balance the energies of Yin and Yang and the Wu Xing within the body in order to help the being move closer to the state of Dao because this is the state which is the most natural and healthy. The Nei Jing Su Wen continually reinforces the fact that illness manifests only when one becomes out of balance with the environment or the emotions become disturbed. This is a slight simplification which I do not have time to elaborate on in greater detail. 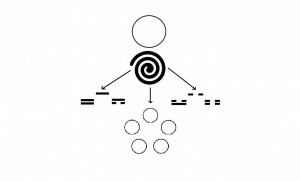 Whereas working with the Qi does have a strong benefit to both the Shen and Jing frequencies there are some theories which suggest it is more beneficial to work directly with the Shen frequency if possible; in this way we affect the process of refraction of consciousness at a more fundamental level so it will not continue to manifest as an imbalance at the Qi and Jing frequencies. It is curious to see that in this respect the Daoist’s originally cared very little about health and medicine; it was relevant only in giving a practitioner of meditation a good platform on which to attempt to attain a union with Dao. An effective and holistic system of medicine was simply a result of a higher intention similarly to how an effective martial art or fighting style is simply a result of the same intention. Skills in healing or violence were not goals or even important, they were natural consequences of a correct study of something more. It may be interesting to note that the pre-conditions for existence talked about here very closely mirror the conditions before the Big Bang western scientists now popularly purport. It is worth stating that when element that is supposed to be controlled becomes out of control and negatively affects its controlling element this is known as the insulting cycle which is the opposite direction of the control cycle.